The purpose of this club is the restoration, preservation and enjoyment of classic cars of any style, make or model; raise funds for local charities; to provide and regulate events, tours, rallies and car shows for its members and the community; to encourage skillful and careful driving on public highways; to help in parts location and to defeat legislation that may be harmful to our hobby. 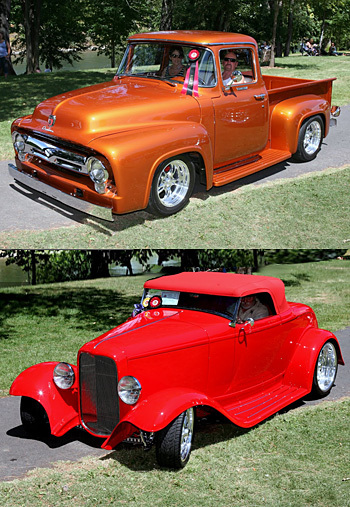 Our major project is the annual Charity Car Show held the end of July each year at Riverside Park in Grants Pass. It's purpose is to raise funds for local charities and automotive scholarships at RCC. We select 3 major charities each year as well as 2 ongoing scholarships at RCC. We also donate to several needy charities throughout the year. It does not matter what make of vehicle, all are welcome. Cars must be 1974 or earlier to participate in the show. See our Show Winners Gallery for photos of past trophy winners. Meet our Board of Directors and contact our staff for any questions you may have. We also provide a Newsletter, Flyers & more throughout the site. Below are the Major Sponsors who continue to help make this event a successful charity car show for RVCC. We thank them and hope you will support them throughout the coming year. We also have 2nd Level Sponsors and Support Sponsors. Please See Our Sponsors Page For All Sponsors and to visit their websites.